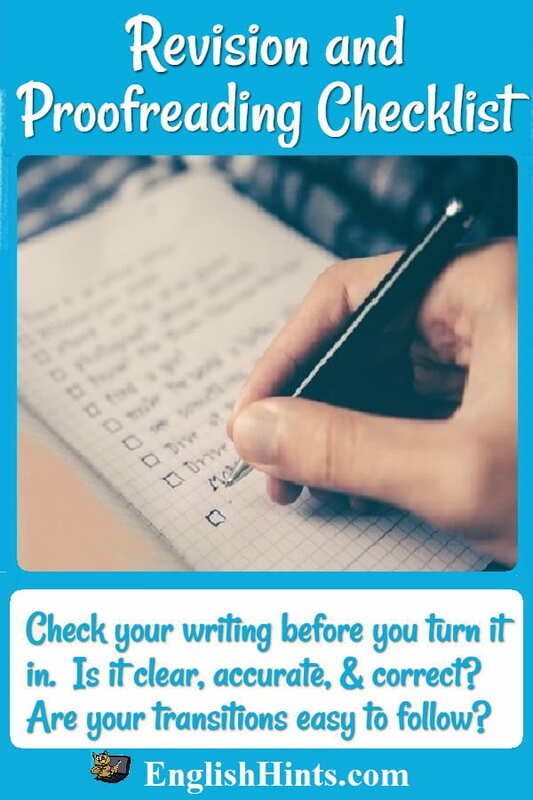 Use this revision and proofreading checklist to make sure your essays or other written assignments are as clear and well-written as possible before you turn them in. Make it easy for your readers to understand your thoughts! 1. Did I completely answer the question or explain the idea I want to share? 2. Is what I wrote clear and easy to understand, or could it confuse some readers? 3. Are the transitions between ideas and paragraphs clear? Can readers understand how each idea connects to the next and to the whole essay? 4. Does each paragraph have one main idea, and support the main idea of the whole essay? 5. Do I give enough examples and evidence to support each point I make? 6. Are there unnecessary words or phrases that I could take out to make it easier to read? 7. Is my use of verb tenses correct and consistent? (Changing tenses too often is confusing.) Can the reader easily tell what happened in the past, what is happening now, and what hasn’t happened yet? Specific verbs are also usually better (when possible) than general verbs with an adverb. Instead of “Anne spoke softly” you could write “Anne whispered;” instead of “Bill said jokingly,” try “Bill joked.” Instead of “he walked into the room” you can write “he raced,” “he hurried,” “he strolled,” “he stumbled,” etc. •	Did I start each sentence with a capital and end it with either a period (. ), a question mark (? ), or (if needed) an exclamation mark (!)? •	Did I connect independent clauses with either A) a comma and a conjunction (‘and’, ‘or’, or ‘but’) OR B) a semicolon but no conjunction? •	Does each sentence have at least one subject and one verb? •	Do the subject and the verb agree? >Plural subjects need plural verbs (not ending in ‘-s’): “we see,” “Bill and I are teachers,” “they listen,”“children play,” “trees grow,” etc. >Remember the verb must agree with the subject, not with another noun. For example, “The branches of the tree are long.” The subject is ‘the branches.’ ’Of the tree’ just describes which branches. Nouns following a preposition are not the subject, even if they are next to the verb. •	Did I correct sentence fragments (incomplete thoughts, like a dependent clause by itself (“When he went to the store...” or “The girl, who was very pretty...”), or a subject without a verb (The boy and his friends...”)? 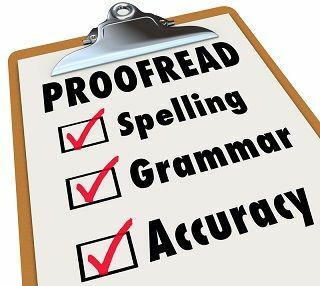 •	Did I correct run-on sentences (complete, unconnected thoughts that should have been separate sentences)? If you ar not sure how to recognize complete sentences (or how to use commas to separate dependent clauses at the beginning of sentences), see the section below. Compound sentences have two or more independent clauses. An independent clause is a clause (subject and verb) which could be a sentence by itself. Examples: “the boy won the spelling contest,” or “his friends had a party for him.” In compound sentences, independent clauses can be connected in two ways: 1) with a comma, then conjunction (‘and,‘ ‘or,’‘so,’ or ‘but’), OR 2) with a semicolon (;) and no conjunction. If a dependent clause comes before the independent clause, put a comma between them. Home> ESL Writing> Revision and Proofreading Checklist.